If employees are already on the premises of the workplace, it is important for businesses to ensure that they will be productive. Even if emails are considered to be really necessary nowadays, there are still some ways to how email usage can actually negatively affect the productivity of the workforce. This is the reason why it is important for companies to have a strong and relevant email policy. Having email policy strict rules can help companies to make sure that the company email will not be used for improper transactions which can result in security concerns and other corporate damages. 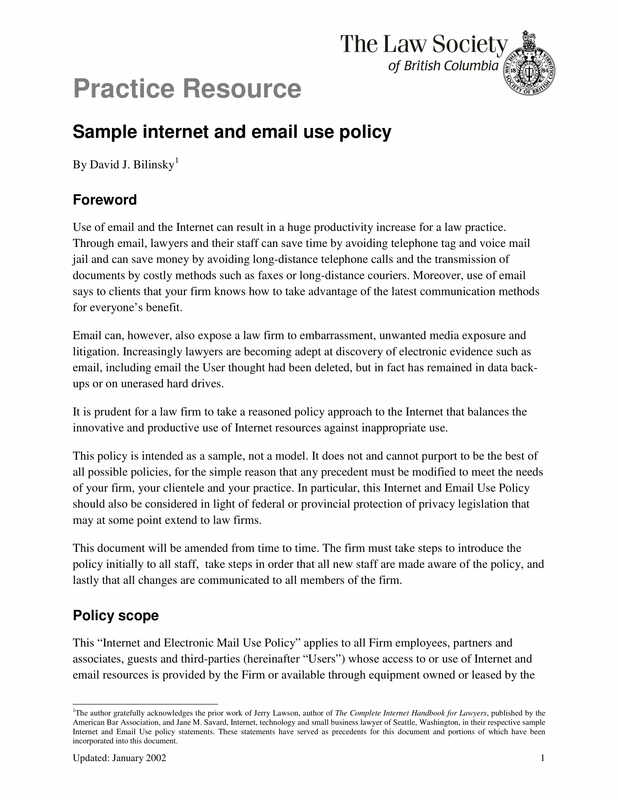 Why Do You Need an E-mail Policy for Your Business? 1. 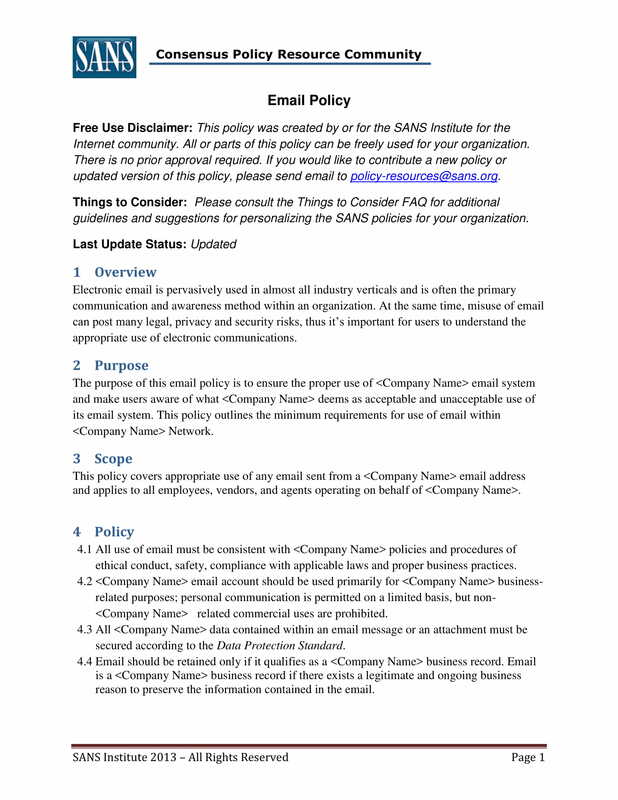 Email policies protect the company’s network from unauthorized data access. There are certain transactions that are personal which is the reason why employees should make sure that they will use their private emails when executing personal processes that involve the use of emails. You may also see financial policy examples. 2. Email policies are not only meant for the companies but the shared networks are also commonly practiced by a lot of organizations and businesses. Without a company policy regarding email usage, it is possible for employees to download content from their emails which can be accessed, used, distributed and shared by other employees. 3. Email policies can be used to standardize email formats, including email signatures. The corporate emails used by employees represent the business. With this, it is important for employees to make sure that how they will present themselves through email transactions are beneficial to the branding and image development of the company. 4. Email policies can easily counter lost productivity. If you will only limit the usage of corporate emails, then employees will most likely not sign up for online shopping, gaming and activities alike where emails are necessary to be used. You may also see customer service policy examples. What Should Your Email Policy Address? 1. The effective date of the email policy implementation. 2. The reason or the purpose of the email policy. 3. The statement that the email policy is for all the employees of the company. You may also see policy proposal. 4. The terms and conditions that can make an employee face consequences due to improper email usage which includes sending messages of harassment to co-employees, the management or the clients of the business. 5. The allowed systems and/or networks that can provide the betterment of email transactions. You may also see travel policy examples. 6. The date when the content of the email policy has been disseminated in the workplace. 7. The description of the items or activities where the corporate emails can be used. 8. The acceptable usage of corporate emails based on the department where the employee is immersed in. 9. The discussion of the proper usage of the corporate email accounts of the employees. You may also see insurance policy. Once the email policy has been signed by the employees, it is already considered as enforceable. If the workforce has already agreed upon the content of the document, then you can already ensure that they are aware of the specific items that they should follow and honor with regards to corporate email usage. You may also see security policy. 1. 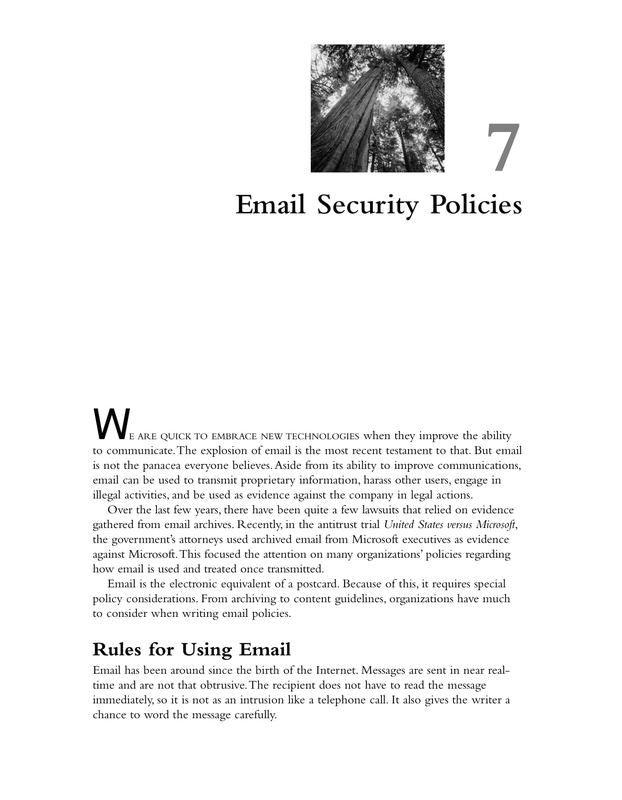 An email policy can help you protect the laptops, personal computers and other gadgets of the business. There are already a lot of viruses out there that can be accessed from different sites. If email transactions will be necessary for an activity that is not work-related, then employees can possibly download viruses that can affect the performance of the equipment of the company. You may also see petty cash policy. 2. An email policy can make it easier for you to ensure that employees are aware of how their email usage can affect their work processes. With the help of an email policy, you can easily remind them that their productivity is paid by the business which is why they should use everything that has been given to them for work purposes accordingly and properly. You may also see travel policy. 3. An email policy can make it easier for the management of the business to control the online transactions of the employees. An email policy can make it more effective for them to develop a pro-active workplace. You may also see appraisal policy. How Can Your Business Benefit from an Email Policy? Corporate emails are created for professional purposes – this is only one of the things that you should make your employees understand. If emails will be used based on their purpose in the workplace, then your employees can have a more formal approach on how email transactions should be done only with the people that are relevant to their work responsibilities. Listed below are some of the ways on how your business can benefit from having a comprehensive and well-detailed email policy. You may also see training policy. 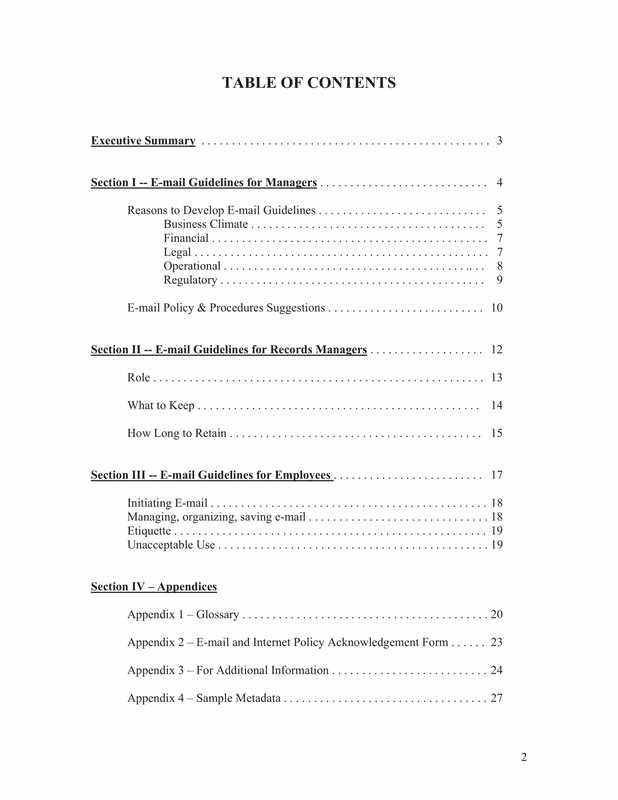 If your company can develop a well-detailed and planned email policy, you can use this document as your proof whenever there are disputes or misunderstandings regarding the matter. 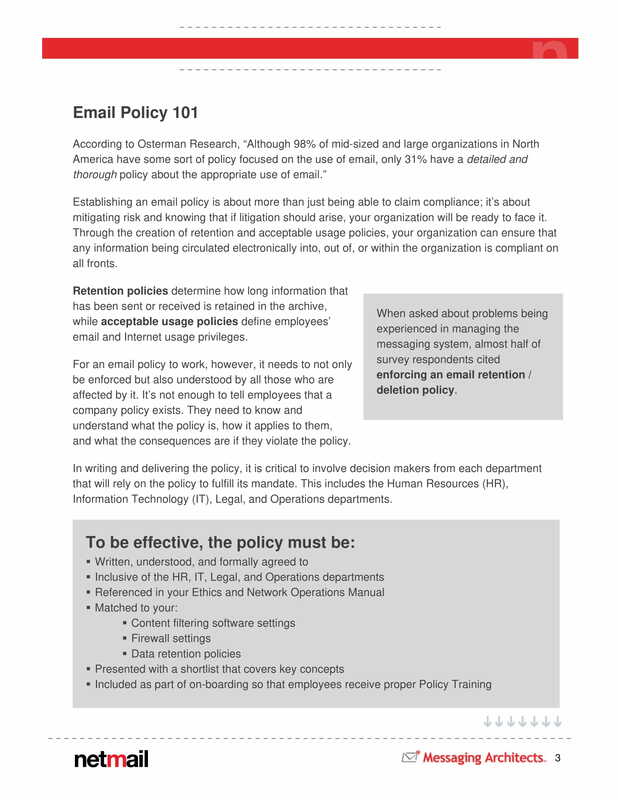 If you will make an email policy and be able to distribute it to employees, you can ensure that misleading information can be addressed, in any case, there will be an existence of such. With this, you can let the employees know about the disciplinary actions that they can be faced with if they will not follow the content of the policy or if they will negate the statements of the business in relation to this matter.You may also see the complaint policy. If your business can present an email policy, then you can already provide an idea about the policy on privacy and workplace monitoring that is followed by the management. If employees will be aware of the email policy, then it is most likely that they can get the gist that their corporate email transactions are being monitored. Still Do Not Have an Email Policy for Your Business? 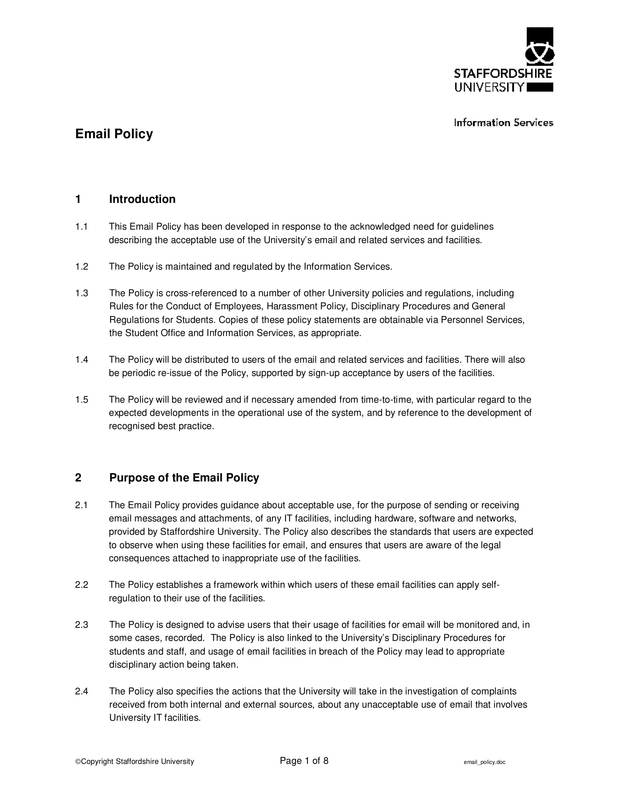 Creating an email policy is actually easy. However, the hard part of this undertaking is that you have to be aware of how the policy can affect the business realistically. This is the reason why you always have to seek professional advice whenever you are already prepared to implement or even create the policy regarding email usage. 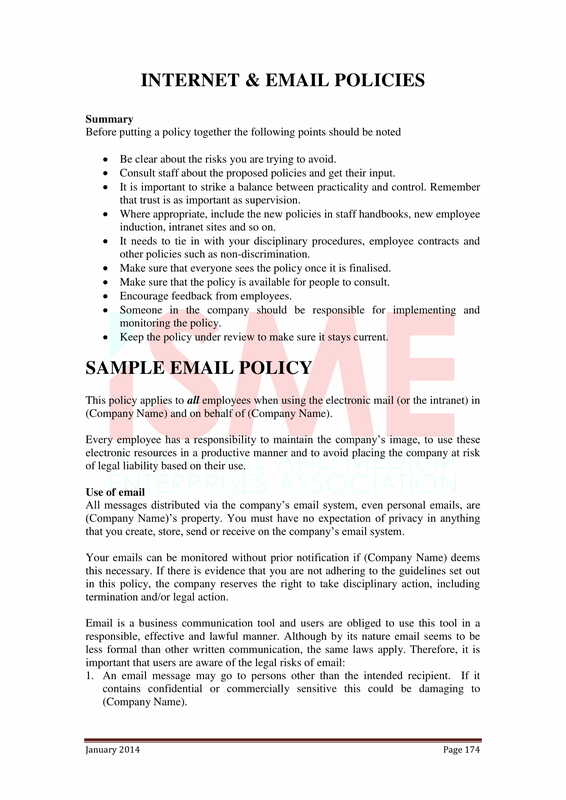 If you are totally clueless about how you can start making your company’s email policy, we suggest you use the downloadable samples in this post as your references. You may also see drug testing policy. Having an email policy can help your business a lot. 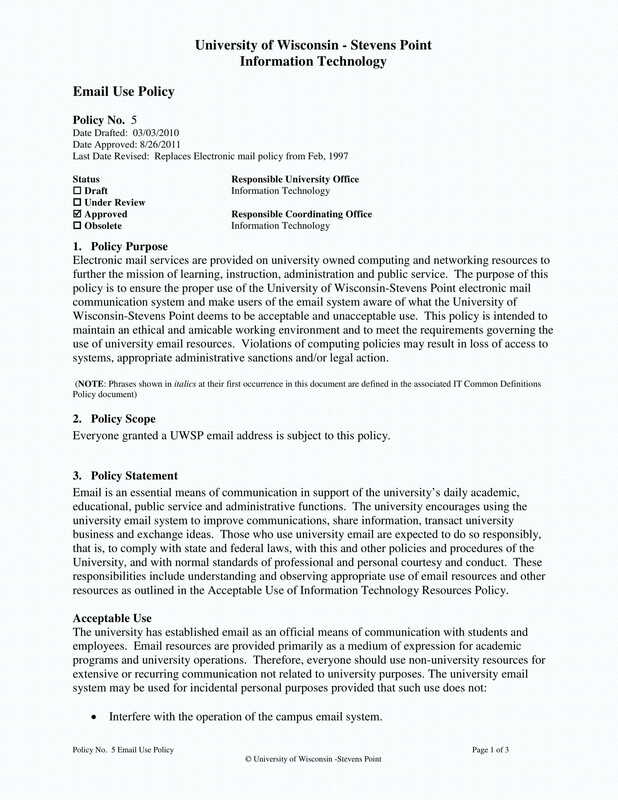 Aside from non-discrimination policy and dispute resolution policy, an email policy is one of the policies that you should focus on. Try making one now and always be reminded of the items that we have discussed. If there are things that you would like to clarify and remember, feel free to browse through the entirety of this article again. We hope that our discussion is helpful enough so that you can already develop a complete and functional email policy.